It was a wonderful Easter weekend! I have to admit I was a little bit apprehensive at first about having Amara spend the night with us Saturday night and then having dinner ready on Sunday but I was so wrong! Jenna had told me to put Amara to work and so I had planned the meal based on the things she could do to help. I have never had a big meal like that be so low stress. Having Amara in the kitchen took a huge load off me and we just had fun! But let me back up a bit. 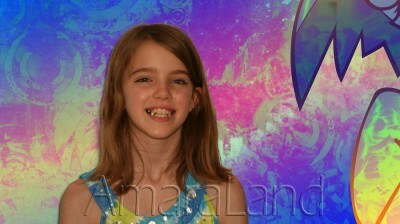 I picked Amara up from art on Saturday afternoon. Her parents had suggested that the two of us go to an Open House in that same neighborhood because the interior of the house is designed like a castle. They thought we would have fun and we probably would have but as I was leaving to go get Amara the girls across the street were outside playing with their hose and wanted to know if Amara could come join them. I told them I would be right back with her. When I got to art, I let Amara decide which she wanted to do — open house or the girls. There was no question — playing with the girls trumped an Open House even if it is a castle! She ran in the house to give Grampy a quick hug and kiss, drop her bag and change into her swimsuit — oh and grab the water balloons from the garage! And she was off! She came back shivering about an hour later and was easily convinced to take a nice warm bubble bath! On our drive home I had told her about some of the projects I had ready for her so when she got out of the tub she was anxious to get started frosting and decorating the cupcakes I had baked for her. Grampy was anxious to help taste test the jellybeans! 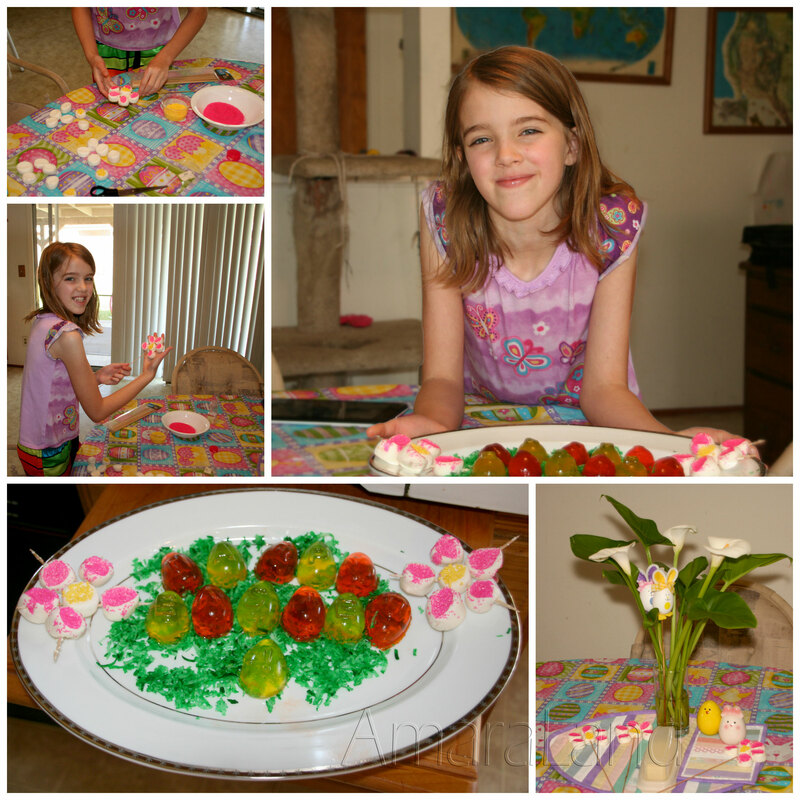 Decorating cupcakes was followed by pizza and a movie – Frozen. I knew she would bring it. She’d only watched it 5 times already! She knew every word to every song – she sang most of them to us. There were many songs. Sunday morning Amara got up and made orange and yellow Jell-O to fill the Easter giggler trays I had gotten. We had left over “grass” from the cupcakes and she used it to cover the fact that the largest platter Grandma had was from the Christmas china! The green coconut covered the gold star quite nicely! She alternated orange and yellow letters to spell out Happy Easter! Then she had an idea! She wanted to make special flowers for each of us. She knew I had all kinds of sprinkles, but did I have marshmallows and toothpicks? Of course! (Whew!) So she sat down and made a marshmallow flower for each of us to eat. She had gotten the idea from an issue of her American Girl Doll magazine! One of the best parts was when she did the math to determine how many marshmallows she needed to get out of the bag. I just love that she challenges herself to figure these things out and explains them to me as she does it! Once the flowers were done, she proudly made the entire corn soufflé. She read the directions and measured everything into the bowl and did all of the stirring. The only thing I did was hold the bowl while she scraped it into the pan. It was wonderful having such a great helper! On the other hand, maybe I was the helper! 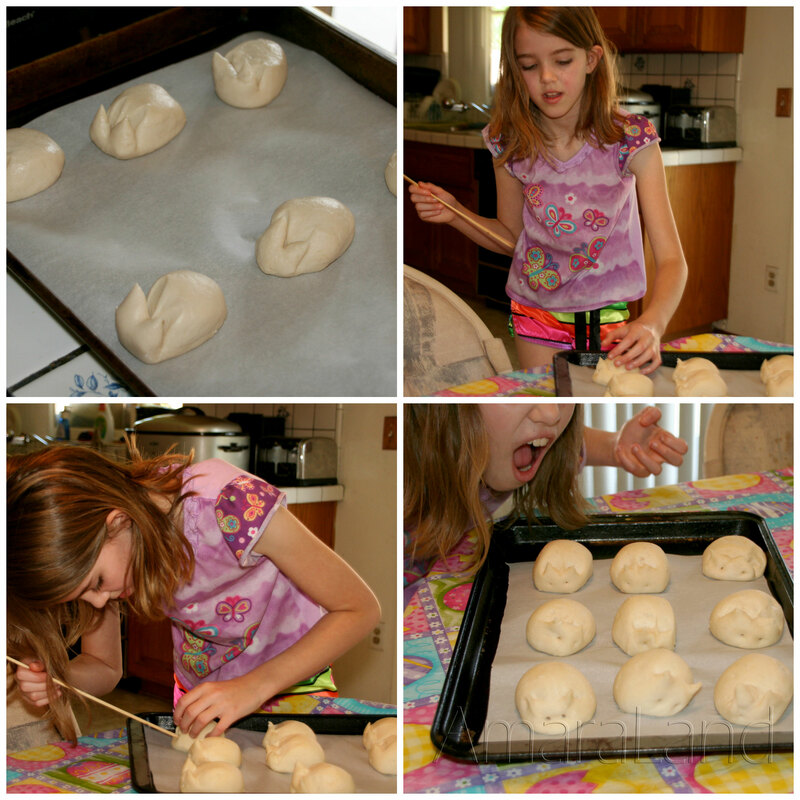 She had fun doing the math to find out how many bunny rabbit rolls would go on each baking sheet, too. If there were going to be 18 bunnies and we had 2 cookie sheets, how many rows, how many in each row… She was so proud of her bunny rabbit rolls and how big they got before she could give them eyes and get them ready for the oven. She even suggested we give them tails! I had made the cheesy potato casserole the day before and I was responsible for the ham but the rest of the meal was pretty much all Amara. It was a wonderful Easter and we have decided that it should be a new tradition for Amara and me to cook Easter dinner together every year! I love starting new traditions! 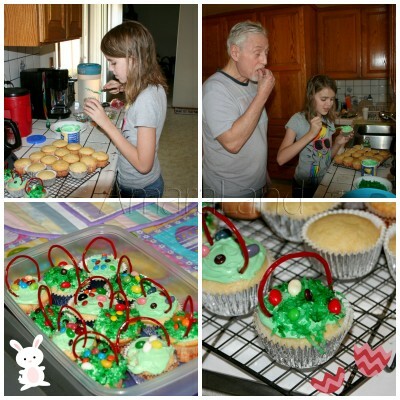 This memory was posted in Special Occasions and tagged baking, Easter, traditions on April 23, 2014 by Grandma Kc. What a great tradition to start with Amara. Maybe it can be all the dinners that your family celebrate. Because we live so very close and get to see them often, they usually spend most holidays with Amara’s other grandparents. It is great that she has so many of them close by that they have to divide up their time but I have officially called “dibs on Easter”! What a great assistant you had there and think of all the delicious meals you have to look forward to in the future from such a great cook. It all sounded absolutely delicious, and I love the bunny rolls and the cupcakes. Yum. I am really hoping that cooking together will get us through her teenage years and that she will continue to love to come to Grandma and Grandpa’s house! Fingers crossed! This is a great new tradition! It sounds like Amara has been paying attention to all of the cooking lessons from her mommy & Grama Kc! She is going to be well prepared when it’s her turn to host family dinners in the future! You and Uncle Mark need to come visit so that she could help host a dinner for you!!!!!!!!!!!!!!!! Think of the fun we would all have. Hard to believe she was 5 years old the last time you were here. Wonderful how much she was able to do to make the meal a success. Holidays are all about the traditions and memories they hold. I made those bunny buns, too, but mine came out looking more like kittens. Yes, our bunny buns looked more like kittens than bunnies, too especially after we tried to put the tails on them — but we won’t tell Amara that. We all thought everything was perfect! PS I have an appointment with Time Warner cable tomorrow – keep your fingers crossed for me! Thank You Launna! I’m so glad Amara continues to enjoy her time here. I worry that as she approaches teen age we may be forgotten for a time but for now we will just enjoy every moment with her that we can! I love the way you worded that – women with older grandchildren not grandmothers who are older than yourself! As for borrowing some of our fun – I would be honored if you did! You have lots of fun years to look forward to! That’s a fabulous Easter tradition. And I’m sure Chef Amara loves having such a marvelous assistant as you. I have had one cupcake and a glass of milk every night this week! There are only 2 left out there and I am going to hate to see the plate be empty! We will just have to think up another excuse for us to bake something! As for those rolls – they really were fun! You should do them with the boys – they wouldn’t have to be bunnies – they could be most any critter in fact ours strongly resembled kittens! Only you would report me for child labor! She really is growing up so quickly – and so well! Makes a Grandma proud! What a perfect experience! You inserted lots of education in that fun time you had together. Not only the math and paying attention to detail, but the “artiness” of it all. Your meal came out looking so good with those cute holiday touches. I tried to make my rolls in the shape of birds – yikes. I got aliens! I don’t think you are going to have to worry about Amara skipping out on you during her teenage years. Times like this – with grandma – never grow old for smart, mature and sensible young ladies like Amara! I do worry that the time will come when Grandma isn’t as cool as she is now. Or that the time will come she tries to play me against her Mom. Right now she doesn’t mind holding hands on the playground but someday that will change, too. So for now I will just grab every moment that I can! As for your birds that looked like aliens, I think they were raptors! You are known for your dinosaur adventures! Each of my kiddos were responsible for making something on those special holidays. Still, when I’m preparing a big dinner, I so miss them being all around the table. I believe Miss Lilli Bugg will be my helper. So happy another child from this generation will know something about cooking. Miss Lilli Bugg will make a wonderful kitchen helper and probably a good cook, too! I am so glad that this is something Amara is really interested in and that we can share together. The more we have in common the better my chances are she won’t drift away in about 2 more years.